“Finland is not a country, Finland is a club.” This statement was made by the Minister of International Development Heidi Hautala on 18 February, after a week of hot debate around old boys’ networks, the role of the state in supervising state-owned companies, and the launch of a Transparency International Finland report on how the country’s institutions fight corruption. Even though Finland belongs to the group of the least corrupt countries of the world– so they say – our problem is our small size. Small population means small elites. All of us know the feeling when someone knows someone who knows you or is related to you. This can mean flexibility in decision-making, relatively easy access to politicians and relatively limited bureaucracy. Unfortunately, however, this can also mean non-transparent decision-making, deals made outside of official structures and finally, old boys’ networks. Old boys’ networks were at the heart of the conclusions of a Transparency International Finland on the country’s institutions, along with things like the need for ethical codes for public sector, need to increase openness in decision-making and a need for more resources for anti-corruption work. But the issue that raised the most discussion was definitely “old boys’ networks”. Scoring 9.4 out of ten, Finland ranks second only to New Zealand in Transparency International’s 2011 Corruption Perceptions Index. However, one Finn in two says corruption is getting worse. The launch took place the very same week that a major corruption scandal was shaking Finland. The controversy started when leading Finnish daily newspaper Helsingin Sanomatreported that the managing director of Finnair had sold his apartment to the pension insurance company Ilmarinen, where he also sits on the board of directors. The price for the apartment was around €1.8 million, which is, according to some experts, slightly above the market price. 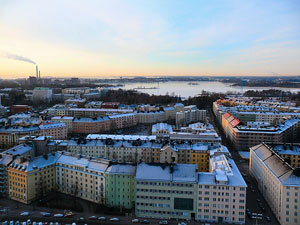 Vehviläinen, however, continues to live in the apartment, and the rent is paid by Finnair. In many corners, such as this opinion article, it was felt that this kind of business dealings are unfair. Ilmarinen collects pension fees and pays pensions, and its investments are supposed to benefit its clients, that is, most of the Finns. Ilmarinen very seldom buys individual apartments. The deal broke no laws, but widespread media criticism was unforgiving of a deal “between boys”. The Vehviläinen-Ilmarinen deal highlights the Finnish situation quite well. While there is very little or no petty corruption, nontransparent business dealings between political and business elites are a problem. Finnish media reacted to the scandal in February by focusing on the small network of people who are represented in the boards of Finland’s major state-owned companies. Transparency International’s Finnish report recommended more resources to investigative journalism. Without the talent and instinct of the journalists at Helsingin Sanomat, the Vehviläinen deal would have hardly been discussed in such a way. This is not the first corruption scandal uncovered by journalists that has hit Finland in recent years: the election funding scandal that took place in Finland a couple of years ago caused a huge controversy, criminal proceedings and legislative changes. Most importantly, as minister Hautala stated in a TV interview on 22 February: all deals like this must be made public. When everybody knows what is being done, it is up to the parties to decide whether the ‘dealing’ itself looks morally good enough to be made in the first place.